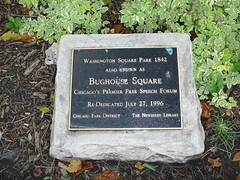 Bughouse Square: aka, Washington Square Park, Chicago, Illinois, North America. A one-time free speech venue populated by radicals, preachers, and assorted crackpots. Me: Toby Higbie. Historian, father of twins, and member of the midwestern diaspora. During the 2013-14 academic year I am in residence at the Newberry Library (across from Bughouse Square) as the Lloyd Lewis Fellow in American History. Many of the images on this blog are available on my Flickr site. This site’s header image was drawn by William Gropper and first appeared in the Labor Age in April 1922. You: welcome to browse and comment. Networked Labor, where I’m gathering up my data visualization work for now. The ALWW wiki is available here — http://linkedlabor.referata.com/wiki/Linked_Labor_Histories — and you can access the data via “Networked Labor” and github. “Stirring the Pot and Adding Some Spice: Workers’ Education at the University of California, 1921-1962,” UCLA IRLE Working Paper (June 2013). Read it Here. “Why Do Robots Rebel? The Labor History of a Cultural Icon” in Labor 10:1 (Spring 2013). Read it Here. See more images. “Unschooled but Not Uneducated: Print, Public Speaking, and the Networks of Informal Working-Class Education, 1900-1940,” pp. 103-125 in Adam R. Nelson and John L. Rudolph, eds., Education and the Culture of Print in Modern America (University of Wisconsin Press, 2010). Read it Here. Learning from the Past to Change the Future: The Justice for Janitors History Project (Curator), (2012 and ongoing–currently working on a new version). Frontier to Heartland: Making History in Central North America (Curator), online exhibit at the Newberry Library, 2010. Global Heartland: a blog about central North America, mostly on hiatus. Outspoken: Chicago’s Free Speech Tradition (curator, with Peter Alter), Newberry Library, September 2004-January 2005. Indispensable Outcasts: Hobo Workers and Community in the American Midwest, 1880-1930 (University of Illinois Press, 2003).